This colourful custom printed water bottle withstands a wide range of temperatures: -10″C to 109″C. BPA free. After being customised with your logo, it is suitable for being carried in a bag or pouch with a secure Double lock mechanism. This item can be paired with a wide range of themed items such as custom printed baseball caps, printed t-shirts, bags, or it can even form a part of your corporate uniform. It is also ideal to be included as part of a themed group of custom gifts welcome packs. Alternatively it can be used as a prize – with your own branding on it, for exhibition games and giveaways. 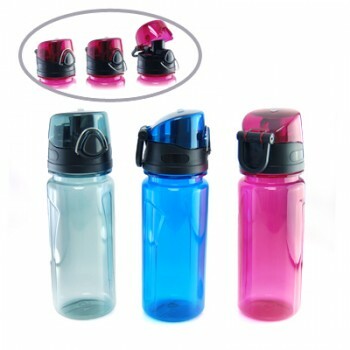 Often times sports teams, schools or uniform groups will order items like this in their team colours with either the logo or mascot printed directly onto the bottle for easy identification of team members.